Shopping centre owner and developer Delancey’s proposals for the Elephant shopping centre narrowly secured approval from the planning committee last Tuesday . The approval is subject to Mayor Sadiq Khan endorsing the decision and the successful conclusion of S106 negotiations, to seal the legal contract between Southwark and Delancey for the delivery of the development. A late application to Historic England for listing the shopping centre has also to be resolved. Southwark’s planning officers were frank when presenting the merits of the proposed development - there were going to be positives and negatives (the negatives known as ‘disbenefits’). In the positive column was a contribution towards a new Northern Line tube entrance, a new London College of Communication campus for University of the Arts London, new homes and new shops. In the negative column was the displacement of the current traders and the unaffordability of the new homes and new shops for local people (or indeed for most people in Southwark). 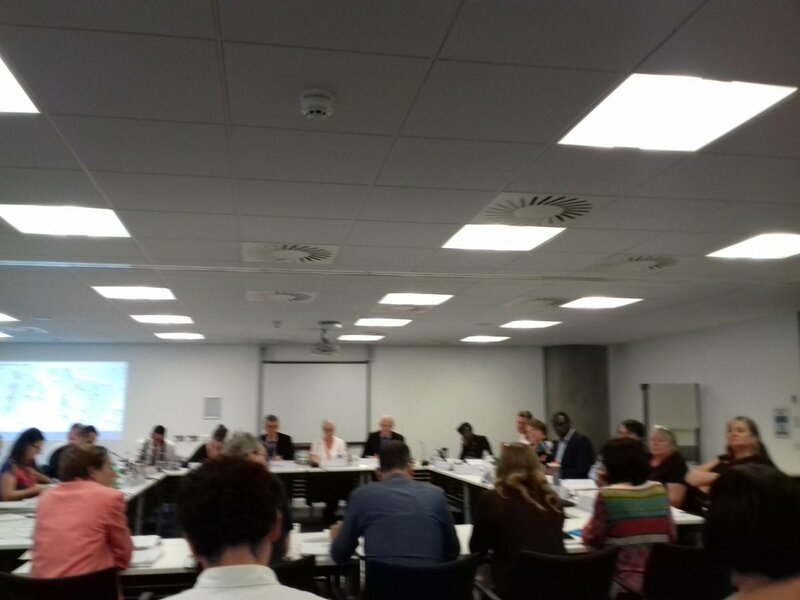 It was for the committee to decide whether the balance lay and in the event it decided by a 4 to 3 vote, with one abstention, to approve the application. In reaching this decision the committee accepted that the so-called mitigation measures, designed to minimise the harm to traders and other users, were sufficient to allow a vote in favour of the development. The committee also set aside its own adopted housing policy which lays out clearly how much affordable housing is required, what type it should be and how much should be social rented. 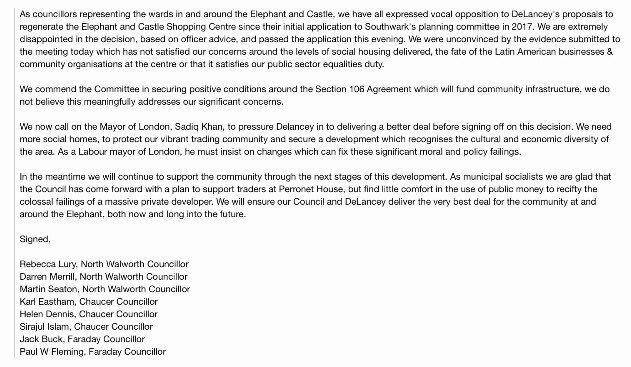 Instead it chose to measure the affordable housing offer against a so-called ‘emerging’ policy, championed by Delancey and other developers, and which entails building less social rented housing (12% of total housing against 17.5%, for the Elephant area). The affordable housing offer even fails by this measure, because it has too little London Living Rent (LLR) and, at nearly half the total units, too much affordable housing at 80% market rent, but the application was approved despite all this. As a bonus Delancey also obtained the option of a Build to Sell (BtS) scheme on the West site, while still retaining a Build to Rent (BtR) scheme as its main proposal. This means the committee has approved a major application without knowing the exact tenure of half the housing. Other complications arise because different housing policies apply, depending on whether a scheme is BtS or BtR, and each has different affordable housing requirements. If the BtS scheme is chosen, then more social rented housing would be required (subject to viability). Council officers insisted that they were ‘confident’ that this additional social housing would be secured, because of their expertise in monitoring S106 agreements (not a confidence the Local Government Ombudsman shares). The BtR scheme has its own complications, one of which is ensuring that the proportion of LLR units are maintained at the consented level. This is a problem, because Delancey wants to reassess eligibility for what it likes to call ‘subsidised housing’ at the end of every 3-year tenancy. If a LLR household has enjoyed a salary increase over this time, it may jump up a rent band and cease to be eligible to remain in a LLR home. The number of LLR units is already too low, (53 against about 150 units) and Southwark have proposed two equally impractical and almost incomprehensible ways of making sure they do not drop further. The officers were not asked to explain why Southwark feels the need to contort itself this way and not simply tell Delancey to comply with adopted policy and thus avoid these complications. 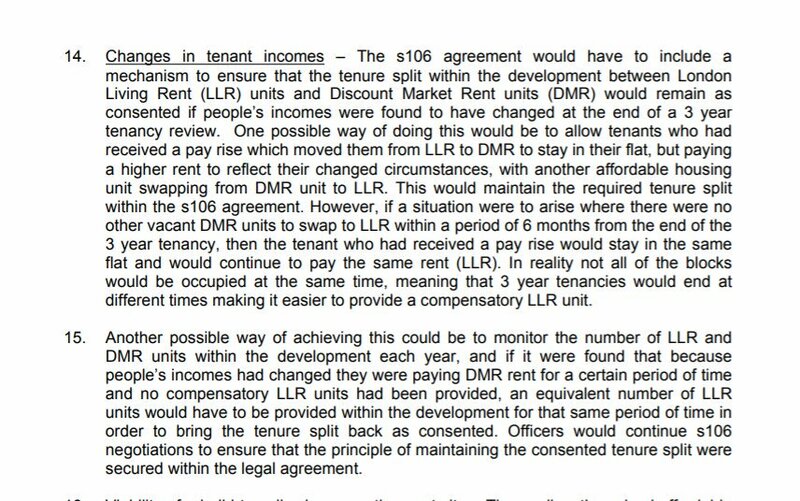 The committee did ask some questions on the practical effect on tenants of this recurrent means-testing, such as what happens if a tenant household income goes above £80,000 pa (answer: the rent doubles) and would you have to leave (yes, could happen). The planning officers again reassured the committee that they can resolve this affordable housing dog’s dinner in a consistent and flexible way, in S106 negotiations. The committee decision to approve the application also tacitly accepts officers’ assurances that all that could be done to mitigate harm to the traders was being done. This was despite the traders’ objections that there was no relocation strategy in place, that the relocation fund was inadequate (£634,700 - an average of about £6,000 per trader, according to one committee member) and that their businesses were being ruined by Delancey’s poor upkeep of the centre, as well as future uncertainty; traders have been told by Delancey they would have to leave the centre by March 2019, regardless of the outcome of the planning application. A trader’s panel is now to be put in place to solve all these problems. Southwark is also content that it is fulfilling its public sector equality duty (ie that it has paid due regard to the harm the development will cause to ethnic minority and other groups), despite being warned by Southwark Law Centre and Latin Elephant that it has ignored other protected groups, such as women and the young. Palaces’ bingo and bowling has withdrawn its objection to the application, but council officers acknowledged that allowing a bingo operator first right of refusal for the use of some leisure space does not guarantee the bingo will return in the new development. Nor does this right of refusal solve the problem of what bingo users do between the centre’s demolition and completion of the new development. Most of the bingo users are from black and ethnic minority backgrounds. The bowling alley, much used by young people, does not benefit from even the small protection given to the bingo. The justification for accepting a proposal that drove a coach and horses through its housing policy and displaces the Latin American and ethnic community who have made the Elephant their social home was ‘viability’. Delancey told the committee that their estimated level of profit was at ‘breaking point’ and nothing more could be offered in the way of affordable housing, but then stunned everyone but themselves with the admission that it was only paying £260,000 towards the extra 42 social rented units (lifting the number from 74 to 116 units), the rest of the cost being met by a GLA affordable housing grant of £11.25m, thus maintaining Delancey’s estimated profit at £148.4m. This equates to about 15% GDV (gross development value) or 1.5% pa, according to Delancey. The committee rests its hopes of improving the affordable housing through a so-called viability review mechanism, which at some later date will supposedly establish the achieved level of profit. Southwark’s viability advisor’s, GVA endorsed this approach, saying that it would be an open-book appraisal, with all the figures being made available, but given that Delancey are even now keeping critical information confidential and Delancey’s off-shore company structure one can be forgiven for doubting this. GVA’s written advice cautions ‘It should also be noted that there is no certainty that the Social rent on the West Site will be delivered as this is some way in the future’. All the 116 social rented units will be on the West Site and although this was said before Delancey secured the promise of GLA funding, it is still a pertinent warning. Staunch support from the University of the Arts London (UAL) undoubtedly helped turn at least one committee member’s vote Delancey’s way, through fear of the LCC upping sticks were the application rejected and UAL will be rewarded with a new London College of Communication campus. We know from staff and students that new facilities are much-needed and no-one wishes to see the LCC lost to the Elephant or Southwark, where they do much worthy educational work, but the fact remains that UAL, along with TfL, are the only current occupants of the Elephant who will unequivocally benefit from this new development. Much will depend on the final terms of the S106 agreement, which will include the conditions on the traders’ relocation and the traders’ fund, amongst other things; UAL should use all its influence with Delancey, on behalf of the traders, to get the best deal possible. The council officers’ repeated response when the committee voiced reservations about the application was that the approval would not be sealed until the S106 agreement was concluded, where their concerns would be addressed. A proposal from the local councillors that the S106 agreement return to the planning committee to ensure this was not accepted. Eight Labour councillors, including the local ward councillors and the deputy leader, have made their dissatisfaction with the decision clear and asked London mayor Sadiq Khan to make improvements. London Assembly member Florence Eshalomi and a local Labour ward has added their voices to the call. Sadiq Khan has wide planning powers and can direct refusal of a strategic planning application, or take over the decision-making himself and given the small amount of one of his favoured housing tenures, London Living Rent homes, he might be inclined to do so, although his GLA officers have been largely supportive, of the application, with reservations about treatment of the traders. He has 14 days to make a decision from the date Southwark refers the applicaion to him. Campaign groups, including the 35% Campaign, Latin Elephant and Up the Elephant have also vowed to continue the fight. The exemplary SE1 twitter feed gives a blow-by-blow account of the meeting, which can also be viewed on You Tube. (NB This post was amended on 16 July 2018 to correct the date the application will be referred to the Mayor).